The Directional Comparison Blocking (DCB) scheme is the most popular pilot relaying scheme, implemented to protect extra high voltage power lines. This scheme is more dependable than permissive transfer trip schemes because it trips the breaker even when there is no carrier signal from the remote end pilot relay. Ofcourse, the protective relays need to see the fault first. Distance relay like the Schweitzer 421 and the carrier equipment Pulsar TC-10B. Power line carrier equipment: line tuner, wave-traps, and hybrids. Output from the carrier equipment is coupled to the power line using line tuners. Hybrids are required to multiplex signals (Tx/Rx) from the carrier equipment. Wave-traps limit the carrier signals to the intended line section. Let’s examine the DCB scheme using the figure below and its scenarios. This fault is internal to the circuit breakers CB1 and CB2. These breakers are the closest to the fault and tripping them will isolate the fault. In this scenario, CB1 and CB2 will be tripped without any delay by SEL-421. The fault is external to CB1 and CB2 but internal to CB3 and its remote end breaker(s). Since zone 2 protective element on the CB1 relay can trip on it, it should be blocked from doing so. The intent is to trip the breakers local to the fault rather than taking out a larger portion of the system. Thus, while CB3 takes measures to isolate the fault, CB2’s zone 3 element (which looks backwards) detects this fault as external and keys a “block from tripping” signal to CB1. It should be clear now that the SEL-421 at CB1 uses zone 1 and zone 2 to detect faults and that zone 2 is a time delayed logic that acts as a backup to CB3 when it fails to operate. CB’s 1, 4, and 5 should trip to isolate the fault on Bus 1. If CB1 fails and does not trip then its breaker failure logic will send a transfer trip signal to CB2. 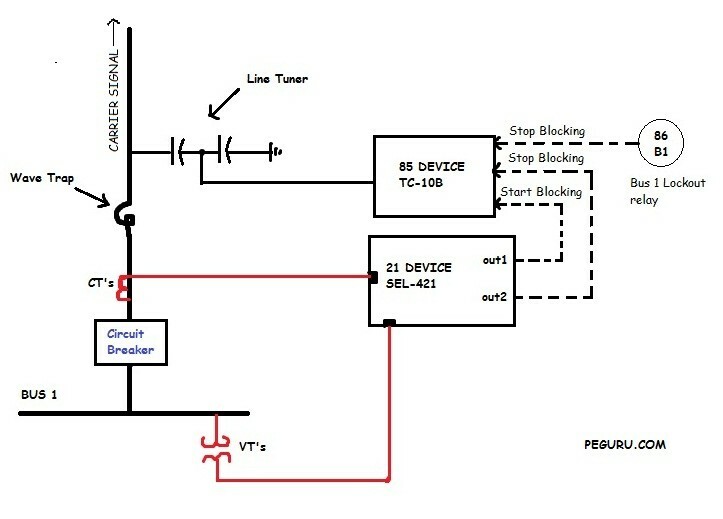 Typically, a bus lockout relay is tripped when a breaker connected to the bus fails. The lockout relay is capable of tripping multiple CB’s at the same time. A contact from this relay can be assigned to the 85 device at CB1 so that it can key the Direct Transfer Trip signal. See figure 2 for the oneline implementation of this scheme. The DCB scheme is typically used as the first line of defense against faults on the high voltage or extra high voltage transmission lines. When using the power line carrier, the DCB logic is implemented by TC-10B equipment using RF frequency for both transmission and reception of carrier signal. Dependable scheme since relays do not rely on trip signal from remote end substation to provide protection for internal faults on transmission line. However, to check the integrity of the communication channel, a test signal is transmitted 3 or 4 times a day. I am sorry I assumed that zone 2 under DCB is the same as zone 2 under distance protection , now everything makes sense . Thank you !!! I have two questions for fault F2 on line , why are we blocking the tripping of CB1 , as CB 1 has zone and fault f2 , occurs on zone 1 for CB 3 , CB 3 will go out faster anyways than CB 1 , so why are we doing that ? Second , if should CB3 fails to operate you want CB2 to operate first the breaker nearest to CB 3 , now that being said , it then indeed makes sense to block CB 1 from tripping beacuse , if CB 3 fails CB2 will operate and clear the fault , and CB 1 will be blocked from tripping under zone 2 . So that is my main point of confusion . Thanks for these information. Finally able to kill my confusions.